On May 13, 2012 Fr. 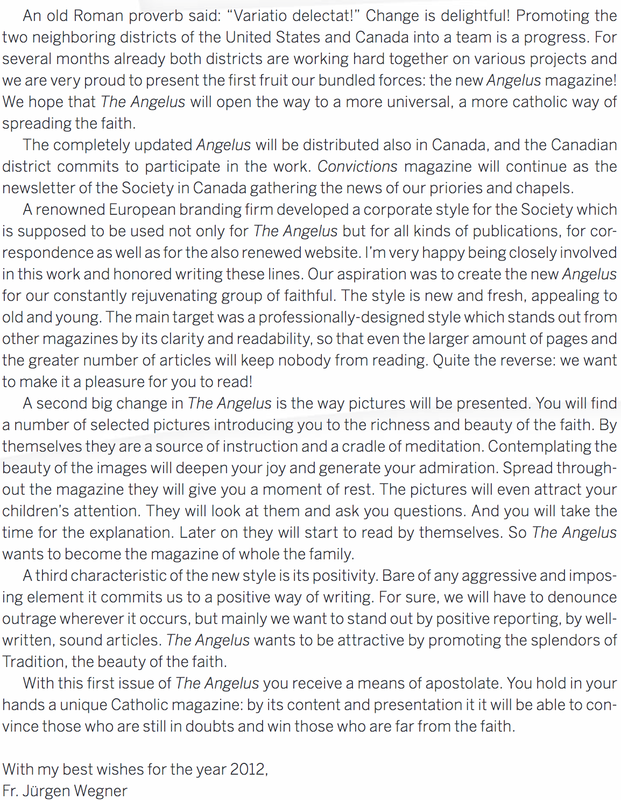 Wegner gave a sermon at the Church of the Transfiguration in Toronto where he spoke about this company and what an executive of this company said to him. You can listen to the recording at the link below. Start at the 22 minute mark. That would seem to indicate that the beginnings of this branding happened around 2010 (a couple of years ago). If so, that would make this even more interesting. For the fact that in 2009 the second "condition" of Bishop Fellay was satisfied by the "lifting" of the excommunication(s); So a "practical deal" can be made more "smoothly." Also, Bishop Williamson was "set-up" in 2009, be it Providential as it may, it was a situation that Bishop Fellay had to also "re-brand" the SSPX if it was to cushion up to conciliar Rome if it was going to continue anywhere with the work of GREC. In addition, it could have also been another [secret] concession on the part of conciliar Rome to Bishop Fellay -to clean up your "act" if you want to come in. And the other parts of the time line continue as described above in 2011 exchanges with conciliar Rome for a "practical deal." Who thinks +Lefebvre would have paid this price to Ratzinger for 'lifting of excommunications'? How unChristian to get more members by joining up w/heretics and hiring 'important, successful' holland (danneels?) advertising firms. Surely not following the example of Jesus Christ nor trying to build up His Body/win souls for His Kingdom (or +Lefebvre's SSPX): I have planted, Apollo watered, but God gave the increase. Therefore, neither he that planteth is any thing, nor he that watereth; but God that giveth the increase. Now he that planteth, and he that watereth, are one (nope: +Lefebvre is still excom). And every man shall receive his own reward, according to his own labour. For we are God's coadjutors: you are God's husbandry; you are God's building. According to the grace of God that is given to me, as a wise architect, I have laid the foundation; and another buildeth thereon. But let every man take heed how he buildeth thereupon. For other foundation no man can lay, but that which is laid; which is Christ Jesus." "And calling them, they charged them not to speak at all, nor teach in the name of Jesus (VC2 Bishops to their priests!). But Peter and John answering, said to them: If it be just in the sight of God, to hear you rather than God, judge ye." Thank you for the information. We have added it to the post. The most important fact… Is Novus Ordo the Catholic Church or not...is Bergogglio the pope or not...open your eyes… the fact is not just about beautiful liturgy, beautiful vestments...but doctrinal faith...if it is not Catholicism than traditionalists have no business negotiating with Novus Ordo...period...you do so and you will fall in apostasy and schism. I may know less about the FSSP and the SSPX than practically anybody, but let me just say this. No one can seriously say the church is dying, when the pope is in complete control of his apostate men and church. By any serious measure, the church is charging full steam ahead with the demolition. I won't bore you with details you already know, about how in particular this is being done. Now it may turn out that the man in the street grows bored with the wreckovated church, because it does not have Truth and so it cannot hold anyone's attention for long, and even modern man grows weary of being told he can do anything he likes and not only are there no consequences but he will trot off to heaven as soon as he's ready, but, in the meantime, there are millions of souls at stake, Catholics and non-Catholics even who are hungering for Truth, and there are NOUGHT TO TELL THEM WHERE TO FIND IT. Gazing at beautiful things, however laudable, is not sharing the Gospel, pure and unadulterated, and if the Gospel is not shared, including the hard bits, then the faith is dead and souls are lost. We cannot gaze at our bellybuttons and save souls, only the sharing of the Gospel combined with the traditions and beauty of the Catholic faith can do that. Where are the men who will do it? The traditionalist orders who have abandoned their posts for any reason whatsoever are turning their backs on God. The pope and the church are apostate, at this moment. We cannot right the barque, only God can do that. But the Truth can be proclaimed, and yet no one does it. Who better to have held the banner high so that it could be seen even in the darkness, if not the FSSP or the SSPX, but we have suffered these last five years and there is silence from them, as deals are made and Bishop Fellay declares he and the pope have "a good relationship". I would not understand why the SSPX would have credibility at this point. Beauty is fine, well and good, but without zeal for God's house, and the sheep, what good is beauty? In 2018,if you're blessed to have a traditional Catholic chapel,either SSPX-Resistance or Sedevacantist in your area,this is our only option. Either way,they're (Neo-SSPX) unofficially just like FSSP & ICKSP yet they validily ordain,consecrate,and confer Traditional valid Sacraments. I don't know the answer because it's my understanding a valid Bishop or Priest,who received Holy Orders Pre-July 1968,offers a valid Holy Sacrifice & sacraments if offered pre-July 1968? Plus he has jurisdiction & received a mission from the Church upon receiving Holy Orders. It would seem Catholics need sanctifying grace & a valid Holy Sacrifice every Sunday & Holy Day,even if they're are Conciliar. If all you have is Neo-SSPX or a Priest/Bishop who received Holy Orders Pre-July 1968,I'd highly recommend going much as possible! A discerning person who seeks the Truth will see right through a shallow branding campaign that focuses solely on the externals of Tradition and lacks courage to proclaim the faith and defend it...we are called to be the Church Militant and to stand our ground and to defend and preserve the purity of doctrine for the salvation of souls. If the SSPX wants to spend funds on anything then perhaps they should consider spending it on an education campaign for catholics in the post-V2 church...describing the post-V2 catechism as watered down is an understatement, and it has left virtually all of the laity so ignorant of church doctrine that most don't recognize if something is heretical or not. God bless Fr. Girouard. He clearly saw five years ago the direction that the SSPX was going, as did Bp. Williamson. Both are most astute in describing the sad situation in the SSPX today, in that they have given up the battle against Modernism and Vll. Pretty funny that famous Belgian advertising co. doesn't want their name associated w?SSPX unless SSPX changes (i.e. won't take them as a client). So SSPX does change, but still the name of this company is not released or associated w/the SSPX. 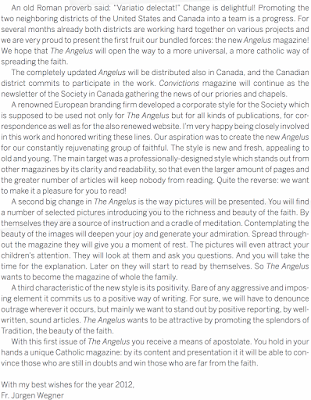 Who is the pagan who re-branded the SSPX? How and why does Fr. Wegner have an association w/this rich and famous pagan? Really if that's what the church is supposed to do to get members, why didn't Jesus Christ follow that path? And if the SSPX thinks they're not Jesus Christ, what prophet did God ever direct to follow that path? Why did John the Baptist leave the BEAUTIFUL temple and robes of the pharisees and go out into the desert to preach a gospel of repentance? What prophet from the Old Testament ever followed such a path? Only example for SSPX 'rebranding' is the hypocrite pharisees.